In the aforementioned entry, I also stated "I'm thrilled to have received this news (Cory's email) for as anyone who has been to book culture On Columbus knows, the store is AMAZING! 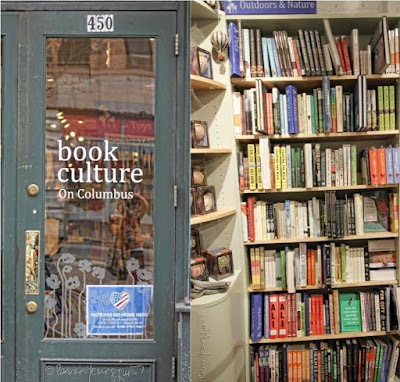 I hope that peeps living in #NYC as well as the surrounding area can pop over to #bookcultureOnColumbus and have a look at it." was now included in their stock. 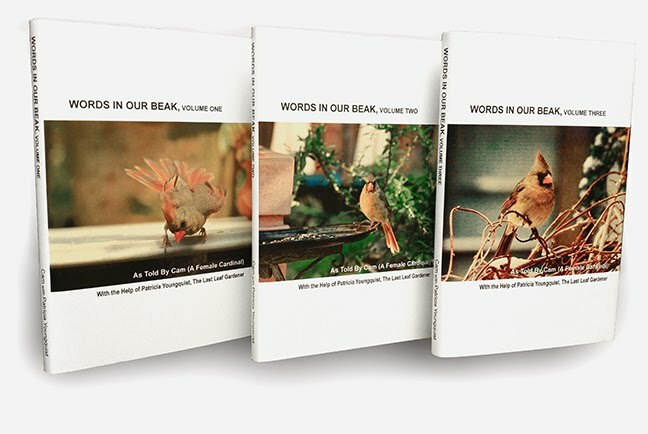 I'm so excited to let you know, dear reader, that you will find Words in Our Beak in their "outdoors & nature section," but, if you don’t see it, ask! It’s shortish size and white spine cover have a way of hiding....especially if there is only one or two copies left. For example, the next picture features what I came upon yesterday afternoon when I was at book culture On Columbus. 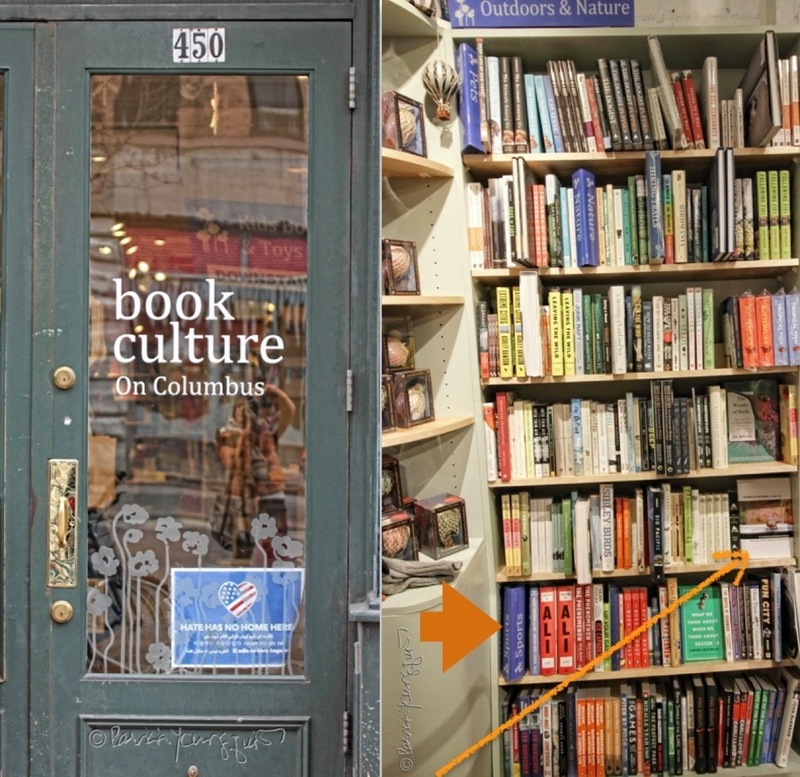 The orange arrow affixed to the image indicates where my book was standing yesterday afternoon when I first came in the store. It is the last one in the their Outdoors & Nature section, because authors are arranged alphabetically (by the writer's last name); and categories of book subjects are separated by big blue dividers which looks like a book. Therefore, after any stock of books that are outdoor and nature themed ends, book culture's sports section begins. My book seemed to be hiding behind their big category dividers. 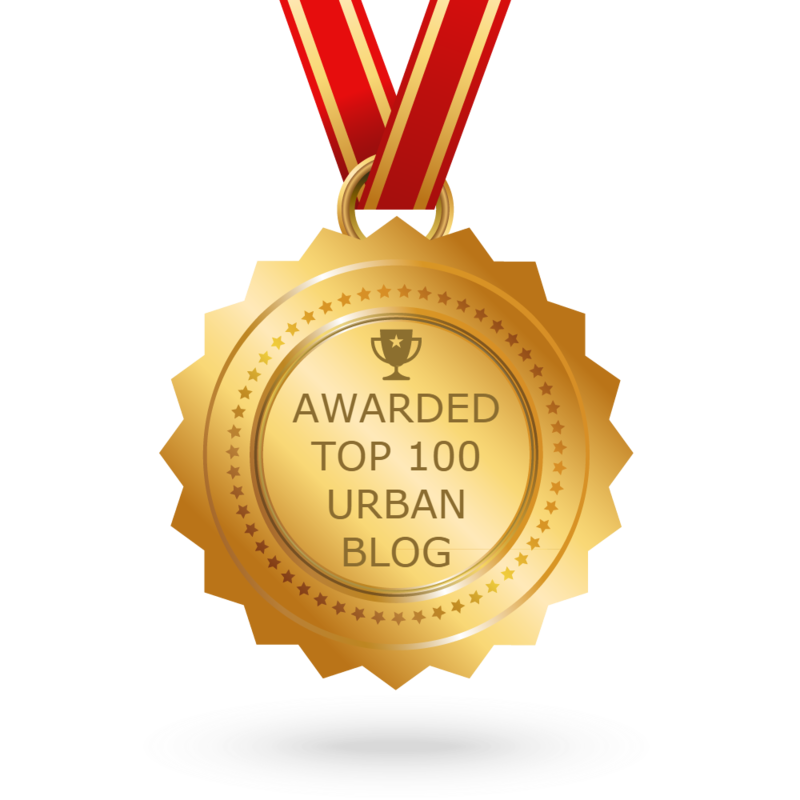 I found myself thinking, how would folks who don't know about my book come upon it? Moreover, many of the books at book culture On Columbus, face forward, which is ideal if one's book has a lot of images (mine includes over one hundred pictures that feature fauna, flora, insects, as well as points of interest in NYC). I expressed my concern to Jory, who is a very helpful sales person, and he realized that there was enough space in the Outdoors & Nature section to have Words In Our Beak Volume One, face forward. He did some rearranging, and before I left the store, my book appeared as is featured in the next photo. But, that still small voice within me nagged at me to get off my you know what; layer up with jackets, as well as scarves, and go to book culture On Columbus. 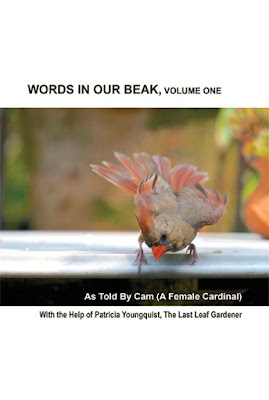 As I came upon the Outdoors & Nature section, I discovered that Words In Our Beak had been moved and I couldn't even find it — at first — and had to ask the evening salesperson (Eldris, who was stocking that section at the time) as to the book's whereabouts. 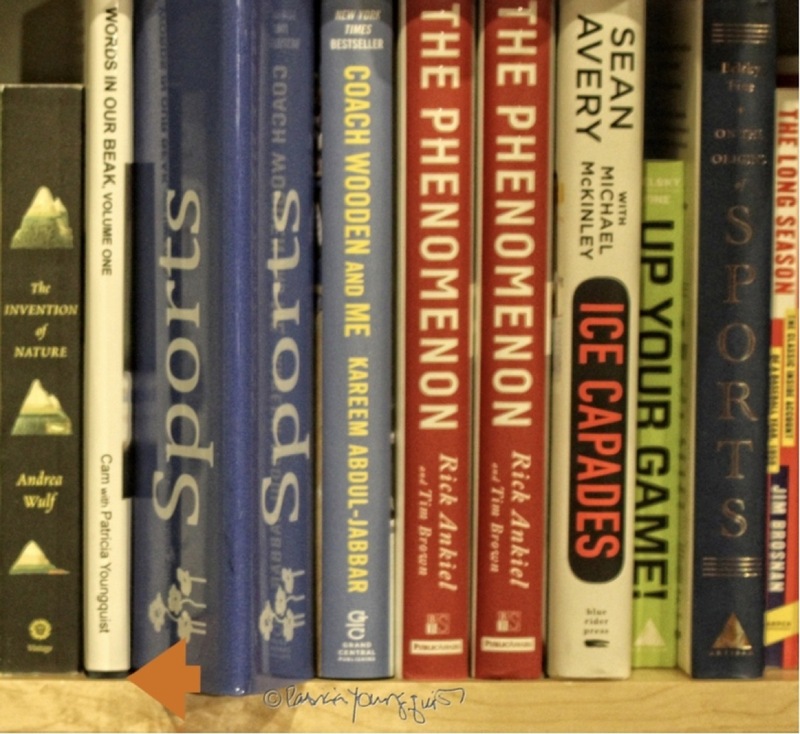 Evidently, the book had been moved to the following shelf that normally ends their Outdoor & Nature section, and begins their Sports section. And since mine is a single copy, it would be so easy to miss, because the next section's divider mark for Sports, nearly hid Words In Our Beak. 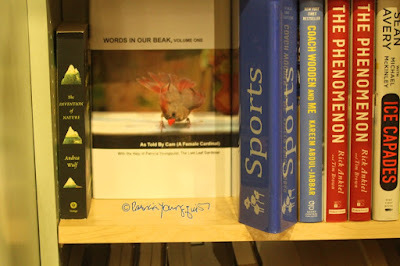 I pointed out to Eldris that my book would not be seen since it was standing on its spine, behind their large section divider and was also out of range re the Outdoor & Nature section. Fortunately, Eldris agreed with me, and, as Jory had done that afternoon, he realized there was space available to keep my book in the section; and have it face forward, as seen in the first image atop this entry. 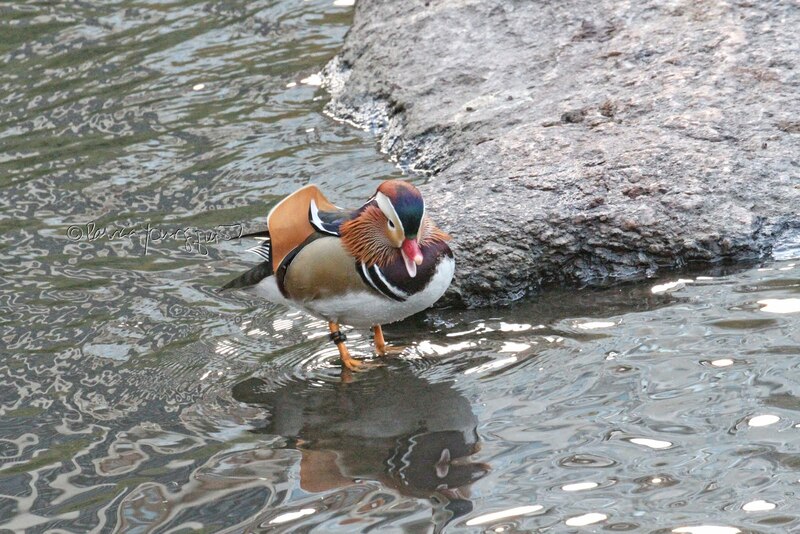 The following picture is a duplicate of the aforementioned image. I've added markings to it in order to point out my placement concerns. 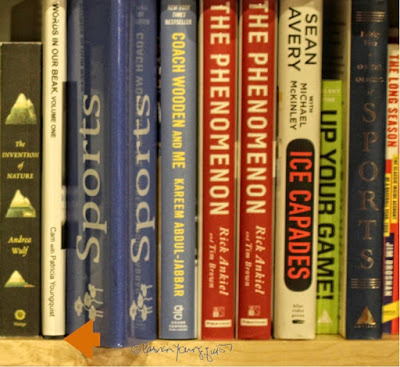 The short arrow indicates the little space where my book had been moved to when I first entered the the store last night and the long arrow indicates how my book's placement appeared after I left the premises. 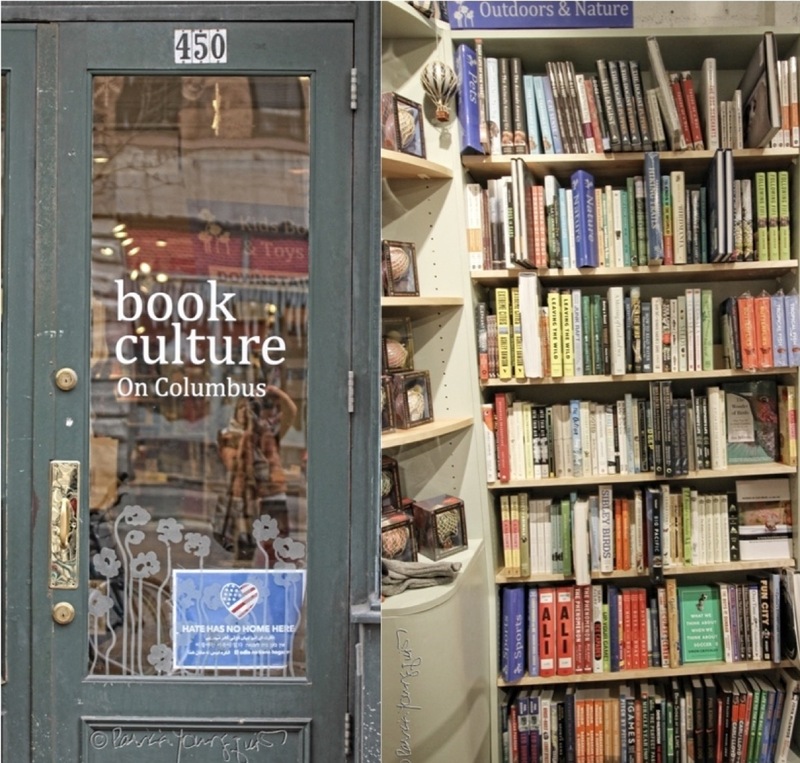 I'm still most grateful to have Words In Our Beak within book culture On Columbus, as it's such a an amazing place. Therefore, my wisdom re this situation, is to tell folks whom I refer to this store to ask for my book if they don't see it. The store's personnel seems to be most helpful; especially Jory and Eldris.